From Hugo Award–winner Tim Pratt comes a new fantastical adventure set in the award-winning world of the Pathfinder Roleplaying Game. Pathfinder Tales novels are standalone adventures written by some of fantasy’s bestselling authors, all set in the lovingly detailed world of Golarion. Here are the same nations, characters, and monsters that have inspired gamers around the world to new heights of imagination. Flames Rising is pleased to present an excerpt from this new novel. “Are you sure you want to be out on the street, given your current situation?” Vadim said. Skiver’s smile slipped, just slightly, and his eyes narrowed, but only for a moment. “I can slit their throats and dump them by the docks if you’re having second thoughts, boss,” he said. “The perfect gift for the man who has everything,” Skiver said, grin at full breadth again. “Come on, Jaya,” Vadim said. “One of my men will show you your brother.” She cast a worried glance at Alaeron, and an even more worried one at Skiver, and then followed Vadim out of the room. When they were gone, Skiver turned his attention to Alaeron. “All right, scholar. Let’s go.” He led the way out of the storeroom, through a number of narrow hallways paneled in dark wood. Alaeron considered trying to hit his guide over the head and run away. After all, he didn’t have a brother locked up in a cage—there was nothing holding him here but a gentleman’s agreement, and Vadim had already proven he was no gentleman. But the fact was, he had to go back to his workshop before he could flee more permanently, and Vadim knew where that workshop was, so giving Skiver the slip now wouldn’t help him much: there might very well be armed men waiting for him when he arrived home. But once he was at his lab, in possession of his tools, then the equation would change. It should be trivial to incapacitate Skiver and make a run for it. Certainly, the possibility of seeing the ruins of Kho was tantalizing, and the chance to spend more time with Jaya had its own temptations. She was treacherous and untrustworthy, certainly, but there was much about her Alaeron couldn’t begin to understand …and he loved nothing so much as the chance to strip a mystery bare. So to speak. But he had to be practical. Such an expedition would be treacherous, necessitating a voyage across the Inner Sea, a trek across the burning sands of Osirion, and then on into the mountains, and once they got there, they were likely to be slaughtered by monsters in the high passes, or murdered by Jaya’s savage relatives—assuming they even existed. If their team beat the odds and actually found the ruins of Kho, who knew what sort of horrors would lurk inside? All that knowledge…but, no, Alaeron had already had his adventure, and returned with his hard-won prizes. He should settle down for a quiet chance at study. He just had to escape from his current predicament first. Skiver unlocked a heavy wooden door that led outside to a stable smelling of fresh hay and old manure. Judging by the sky, it was late afternoon. Alaeron felt adrift in both time and space. “I will take your words under advisement.” Alaeron put all the snobbery and superiority at his disposal into his tone. “If you’re implying—” Alaeron began. They continued walking in silence. Skiver never asked the way to the laboratory, but he kept taking all the right turnings, which meant Vadim and his people were entirely too familiar with the details of Alaeron’s life. As they walked, Alaeron looked around the city, trying to memorize every brick and board of its buildings, every twist of its streets, every drifting scent in the air. There was a good chance he’d never see Almas again, and that thought left a hollowness in his chest as echoing as the great chamber he’d discovered in the depths of the Silver Mount. Alaeron opened the lock, but didn’t perform the necessary steps to deactivate the gas trap. It wouldn’t kill Skiver, but it would knock him out, and give Alaeron time to gather his things and make his escape before the alarm was raised. “After you,” he said, stepping back. Skiver snorted and drew his long, thin knife. “I don’t think so, scholar. Never go through an unknown door first if you can help it. After you.” He gestured with his knife. Alaeron cleared his throat. “Of course. Just, ah, I think I forgot to …” He hurriedly twisted the lock again, deactivating the trap, while Skiver chuckled behind him. Alaeron opened the door and ducked inside. Skiver followed a moment later, eyes taking in every corner of the room, knife in his hand. He slammed the door all the way open, hard, presumably to break the nose of anyone hiding behind it. Satisfied there was no immediate danger, he tucked his knife away, hooked a stool with his foot, dragged it over to one of the dirty windows, and sat down. He licked his thumb and cleared away a little patch of grime on the glass so he could see outside, and alternated between watching Alaeron and watching the street. The alchemist’s travel pack was already prepared. It was just a matter of tucking in the formula books he’d been using most recently, checking the multitude of pockets in his coat to make sure all the appropriate items were in their proper places—it wouldn’t do to reach for a flash-bomb and get a stink-bomb instead—and making sure he hadn’t left any overly volatile chemicals sitting too close to their reagents. He might never come back here again, but that didn’t mean he wanted his father’s laboratory to explode. Alaeron swore and hurried to the door, attaching delicate wires to carefully placed hooks on the door frame, glancing up at the apparatus bolted to a roof beam. “Get away from the door,” Alaeron whispered. “The gas is fairly dense, almost a mist, so it shouldn’t drift too far, but we don’t want to be close to it.” Alaeron scurried to the far corner. Skiver gave him a thoughtful look, then went to the other corner, where Alaeron had hung a curtain to separate his sleeping pallet from the workshop proper. Skiver ducked behind the curtain and out of sight. Alaeron did a rapid calculation of risk. Skiver was probably watching the door and not Alaeron, who was partially screened from view by a battered wooden cupboard full of reagents anyway. The timing hardly seemed ideal, but when would he have another unobserved moment? Alaeron knelt and lifted up a floorboard near the wall. His father had kept an emergency sack of coin in the little space underneath, once upon a time, but Alaeron used it for more precious things. The hole appeared to be empty, but that was a minor illusion purchased from a wizard, so he reached in anyway and drew out a drawstring bag, no bigger than a wineskin, that clinked gently when it moved. Alaeron took the cloth-wrapped items from inside the bag and secreted them in various pockets of his traveling coat before replacing the board. The door rattled ominously a few times while Alaeron was retrieving his stolen relics, and then there was a horrible squeal as Kormak broke in, prying the door away from the frame. The door popped open and a shadow loomed, filling the entryway. The canister attached to the roof beam hissed as one of the pulled wires activated it, spraying a dense greenish mist toward the intruder’s face. Kormak reached up with one huge hand and wiped at his cheek, grunted, and then fell forward as suddenly and solidly as a chopped-down tree. Alaeron smiled—he’d never actually seen the trap work before, and it was gratifying to know it behaved as designed. He waited a moment for the mist to dissipate, then stepped toward the Kellid. The gas should render Kormak unconscious for a few hours, at least, which was ample time to go through that clanking coat of his and see what kind of devices the Technic League had armed him with. Why, with luck, Alaeron could find items valuable enough to buy himself out of this problem with Ralen Vadim—or even to overwhelm the old adventurer by force, rescue Jaya, and earn her no doubt plentiful gratitude. And the Kellid lifted his head, gave Alaeron a smirk full of contempt, and seized the alchemist by the throat. As Alaeron choked and scrabbled hopelessly at the man’s fingers—how could mere flesh grip tight as iron?—he noticed flashes of silver, like tiny metal corks, in each of Kormak’s nostrils. The Technic League used such filters to traverse some of the more poisonous rooms in the Silver Mount—they allowed the wearer to breathe, more or less, while preventing more noxious substances from entering the body. “Greetings, runaway,” Kormak said, and despite sounding nasal and strange from the nose plugs, there was no mistaking the satisfaction in his voice. 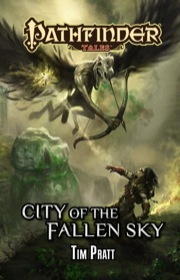 Order City of the Fallen Sky today at Paizo.com. This excerpt was provided by and is being published with express permission from the Publisher, Paizo.